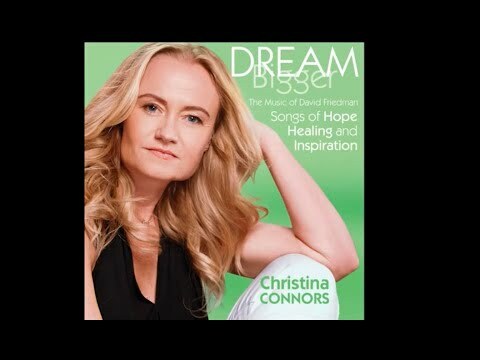 NORWALK, Conn — Christina Connors, a Stamford vocalist with a thriving massage business , will be performing songs from her recently debuted album on Saturday, Jan. 13, at Unity of Norwalk at 3 Main St. at 7:30 p.m.
"Dream Bigger," which was recorded at Norwalk's Factory Underground Recording Studio, features the music of famed Broadway, TV and Disney composer David Friedman, himself a resident of Norwalk. Friedman has composed songs for Diana Ross, Barry Manilow, Nancy Lamott, among others and composes the monthly music with Kathy Lee Gifford for the "Today" show segment “Everyone Has a Story on NBC." A reception will follow at B.J. Ryan’s Restaurant, located at 57 Main St. Tickets are $20 online or $25 at the door. Go to www.unitycenternorwalk.org or call 203-855-7922 for more information.